Single Card Tarot Reading – November 24, 2013. I wanted to apologize for not posting a reading yesterday as I had said I would. Something came up which required my attention for the duration of the day. Thank you for understanding. 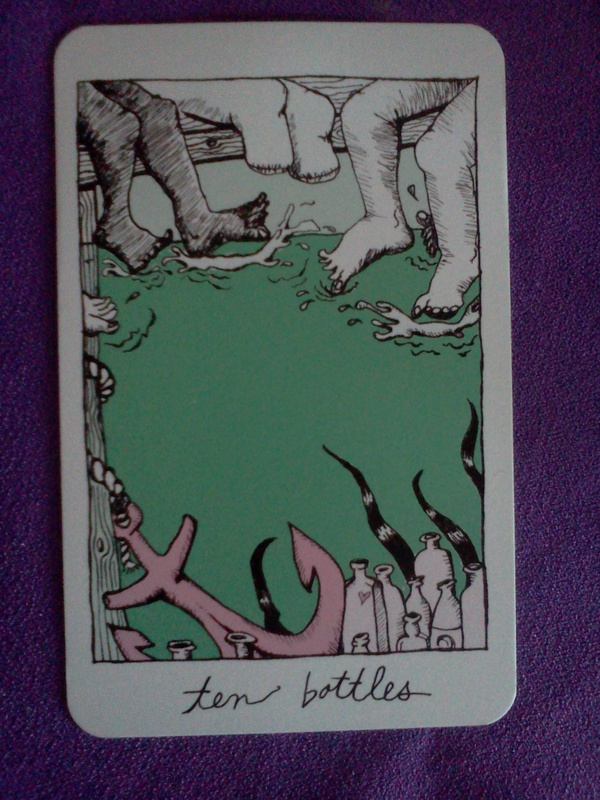 Our card for Sunday comes from the Collective Tarot and it is the Ten of Bottles (corresponds to the Ten of Cups in a Rider-Waite-Smith deck.) The Ten of Bottles is a very positive card. Its all about being in that place (whether physical or emotional) where you heart feels at home and content and right. It is the height of emotional well-being. The Ten of Bottles encourages us to take joy and comfort and support from the people around us, the ones we choose to call family, those who get us, those who understand us. Today looks like it will hold opportunities to feel emotional wholeness. Spend time cultivating those feelings and those circumstances which allow for your emotional well-being. Let go of worries about what next week will bring. Today is about being present in what is good right now. Thank you for joining me this week for daily tarot readings. This will be the last one that I plan on doing. One thing that I learned from reading a card each day and posting it here, was that it felt very impersonal and far too general. One thing I love about reading tarot is that I can connect with other people one-on-one and weave stories and detailed card interpretations based on a specific inquiry. This week was a great opportunity for me to get a better idea of what direction I want to take this blog and how I want my tarot practice to develop. I will be back to posting tarot spreads, exercises and articles the middle of next week, Have a great Sunday.